Nicholas McCarthy is an inspiring and dynamic performer who was born without his right hand. Hailing originally from Epsom, this Star pianist has performed all over the world. As a champion of the exciting and brave world of left hand alone repertoire beginning in the 19th century and developing through Paul Wittgenstein following the First World War with Strauss, Ravel, Britten and other composing left hand alone concerto’s. Nicholas’s historic graduation form the Royal College of Music in 2012 as the first one handed pianist ever to do so made press around the world, in March 2018 the RCM’S president HRH The Prince of Wales awarded Nicholas an honorary membership. This unique performance will showcase a range of dazzling and poetic pieces from Scriabin, Bach/Brahms and Rachmaninoff amongst others including pieces that originated as a result of injuries sustained on the Battlefield in the First World War. 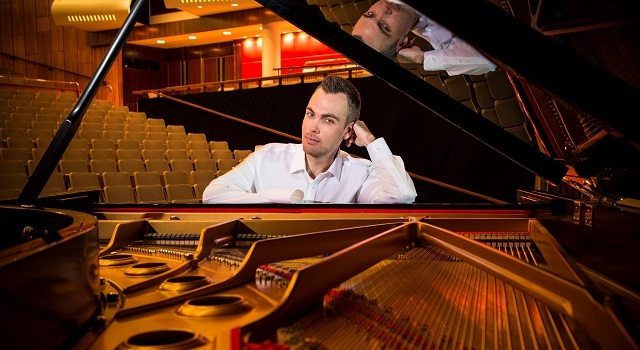 Nicholas will present an evening of music along with humorous and moving stories associated with a rich tapestry of music reflecting the best of 19th & 20th Century Piano master pieces for left hand alone.